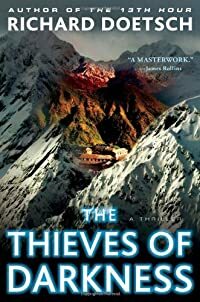 The Thieves of Darkness by Richard Doetsch: Synopsis and Online Purchase Options. Synopsis (from the publisher): Michael St. Pierre, a reformed master thief, thinks he has left his criminal days far behind him, when he receives word that his best friend, Simon, has been locked up and sentenced to die in a brutal desert prison. Breaking into jail for the first time in his checkered career, Michael is stunned to discover that his new girlfriend, KC, is connected to Simon's case. With a madman on their heels, the three adventurers make their way to Istanbul in search of the mysterious artifact that landed Simon behind bars in the first place: a map containing the location of a holy place lost to the mists of time, a repository of knowledge and treasure predating Judaism, Christianity, and Islam. Testing their courage and wits, Michael and his team are forced to plot a series of daring thefts that take them inside some of the city's most celebrated (and heavily guarded) sanctums, from the imperial harem of Topkapi Palace to the tombs of the Hagia Sophia itself. More than priceless artifacts are at stake—the lives of loved ones and perhaps the fate of humanity itself hang in the balance.